Shamrock Pepper Fried Rice Bento, a photo by sherimiya ♥ on Flickr. Here's my contribution to St. Patty's Day, since it falls on Sunday and this will be our last bento before then. A four-leaf clover! Can we call it a shamrock if it has more than three leaves? My pepper happened to be four-lobed, so this is the shape we're going with. I fried a beaten egg inside the pepper ring, and then sprinkled some chopped spinach on top. 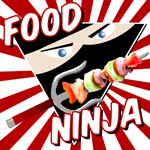 It sits atop a bed of fried rice mixed with ham, edamame, egg and shoyu. I make sure to cook the pepper ring egg thoroughly, as it's not safe to pack uncooked egg for extended periods at warm temps. Alongside the lucky rice: cantaloupe chunks, and pickled cucumbers and onions. Happy St. Patrick's Day! OK, now that's just awesome! 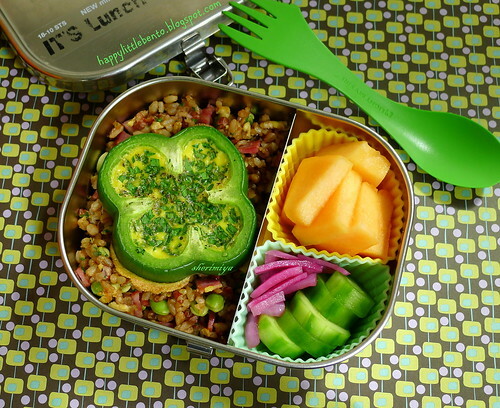 Clever, sprightly and adorable St Patty's bento--yay!! I have that same kind of fork/spoon/spork! I wish I could have that four leaf clover, but I'm allergic to eggs! Sob, sob. Oh well, I'll just have to stuff it with something else! Oh... Keep it empty and it's still cute over rice!! Or keep the bottom and make it a clover cup to hold the rice inside! That's so sweet; thanks a lot megan!